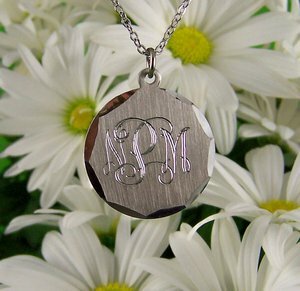 This monogrammed necklace is made of genuine pewter and measures 7/8" in diameter. The pendant has a matt finish with diamond cut edging which makes a nice sparkling outline for the diamond bit engraved letters that also sparkle when the light hits it. The chain is made of a silver color stainless steel that will never tarnish or corrode. The pendant comes complete with an 18" chain and gift box. A message can be added to the back for just $10.00 more. Please include your message.